Well that was a strange little match, wasn’t it? The knock out stages of the Gold Cup began Sunday for the U.S. Men’s National Team as they took on El Salvador in a packed stadium in Baltimore. It was pretty obvious before kick off that the U.S. were heavily favored to win, but that El Salvador was not one of those teams to be taken lightly. In all honesty, I wasn’t sure what to expect to see from this match up. I knew that the USMNT would more than likely win, even though the usual pessimistic fan in me wondered and feared that it wouldn’t be an easy affair. At the beginning of the match, I figured the guys would walk away with a 2-1 win. I would have never dreamed the scoreline would have ended 5-1, as it did. But hey, I’m not going to look a gift horse in the mouth, so to speak. That’s the saying right? Well, whatever the saying is, I’m not going to nit pick at this team, which is something a tiny percentage of fans are doing. Why, I have no idea. Especially when we’re playing some very attack-heavy football, something the USMNT really have never been known for. Like, ever. The U.S. is usually the team that sits back, the U.S. is usually the team that parks the bus and prays they can get a goal on a set piece or a great counter attack. Not this team though. 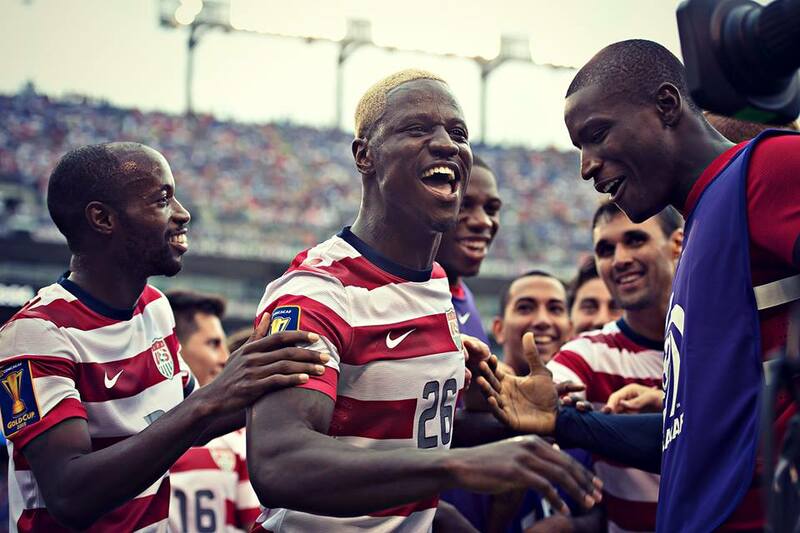 That shift that USMNT Head Coach Jurgen Klinsmann promised us is kind of happening, folks. And why? A great point was brought up by some fellow USMNT and soccer writers. They are saying we’re seeing this because for the first time, in probably recent memory, the U.S. actually have some depth on their roster. Which means guys are pushing for spots. For goodness sake, even Landon Donovan, the face of U.S. soccer, our most well-recognized player, isn’t even a guaranteed starter! Actually, I have an opinion on that … maybe I’ll save it for later. The point is, however, that guys are battling. The starters for the World Cup qualifying matches are sitting back, hopefully watching these Gold Cup games and thinking, “This is awesome, but crap. I have to work harder to keep my spot.” Because that’s the mentality these players should have. Not necessarily a battle between them to cause unrest, but friendly competition to keep each other improving and on their toes. Plus, I think Klinsmann is doing something that Bob Bradley never did. I’ve said this before, but it seems like he’s sitting back and letting them try stuff. Some times does he sit back too much? Well, I’ve addressed that in the past, but I’m really done with that whole thing. For now anyway. What I’m trying to say is that young players are getting a chance to strut their stuff and show the crowds what they are made of. That can be a huge confidence booster and, hey, it can also result in us seeing a team that is more forward minded. That’s what happened in this match. With Clarence Goodson and Matt Bealser in the center defense, Kyle Beckerman holding in the mid and Landon Donovan being – well, Landon Donovan – we got to see some others show off a bit. I mean, hell, Eddie Johnson had a goal after being on the field for only 14 seconds! Jose Torres was showing off some good passing and Mix Diskerurd was getting in some creative moves as well (and finally notched a goal, hooray!). There are things that they need to work on, yes, but like I said in my last piece on the USMNT, I’m really tired of a small part of USMNT fans being Debbie Downers about this tournament and this team. Good things are happening, guys! The U.S. are nine straight on wins, they are building depth and Donovan is back! Like, really back! Let’s enjoy this for what it is and hope when they play Honduras on Wednesday, they will keep their wits about them and have another strong game. And hey, another good thing from this match? You throw sunglasses at Landon Donovan, and he’s gonna wear them. Just deal with it.